Hammerhead 2016 is quickly approaching and the tremendous support, encouragement and really positive feedback from visitors, gamers and traders following the previous two Hammerhead shows, has been very much appreciated. The aim is to provide the best possible one day gaming experience, in which the primary focus is to provide the opportunity for gamers to come along and play table top games – lots of them! Every game at Hammerhead is public participation which creates a very welcoming communal atmosphere – anyone can approach any game and know that they can join in. It’s a great ice-breaker; gamers talk to fellow gamers and readily share their enthusiasm, knowledge and experiences of this fascinating hobby. The trader space around the perimeter of the hall is fully booked with 44 top trader/manufacturers and at the time of writing we have 55 participation games/activities booked. With so many historical and fantasy games in different scales to choose from, you’re sure to find games to play and enjoy. By collecting ‘game slips’ from each game that you play, you can then enter into the £100 prize draw. As with each Hammerhead a specially designed figure has been commissioned. 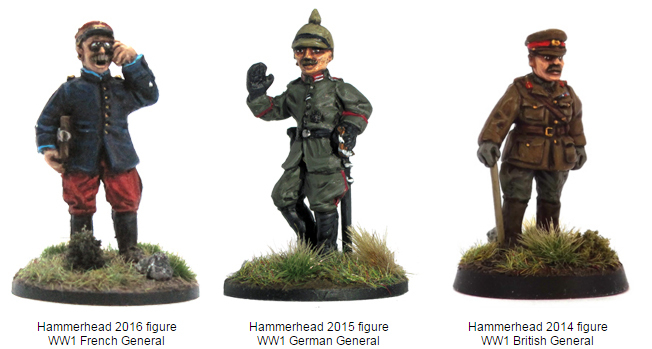 The Hammerhead figure for 2016 is a French general and is available only on the day of the show as well as the British and German generals from the last two years. Anyone booking their Hammerhead ticket on-line will receive a free miniature on entry - any one of the three, the choice is yours! All the generals will be available to purchase for the token price of £1 each throughout the day. Every trader and manufacturer from the 2015 show is returning for Hammerhead 2016, plus a few more from the growing waiting list. Lots of the intrepid clubs and groups who ran such a varied selection of splendid games last year are returning along with many new great looking games. 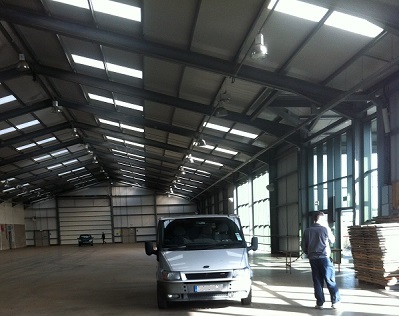 The George Stevenson Exhibition Hall at Newark Showground is a very large (3000 square metres), modern, insulated space with plenty of natural light. There is virtually unlimited free parking around the building for everyone in attendance. 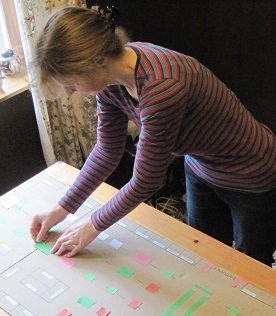 Sally has spent a lot of time working on the layout for the show using a large cardboard 2 metre floor plan drawn to scale. We have measured the entire interior of the building using tape measures, to make sure that we know the exact position of every pillar and doorway! Although this seemed a chore at the time it has proved invaluable and has enabled Sally to allocate trade and gaming space with both accuracy and confidence. 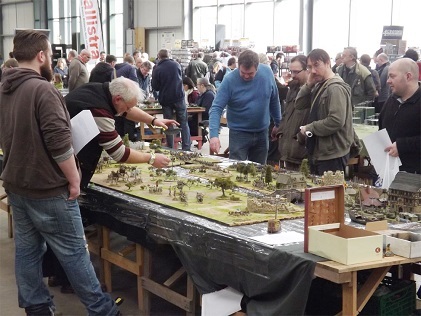 At any wargame show there are three very important and distinct groups to cater for and accommodate; the visitors, the clubs and groups presenting the games and the traders/manufacturers. Each have specific requirements and in the organisation of Hammerhead we have endeavoured to satisfy as many as these as we can. For the visitors to Hammerhead, we promise to get you into the venue quickly and efficiently with two tills and points of entry from the entrance foyer. The show officially opens at 10am but we will open the doors as early as we can if the weather is inclement. The venue has full catering facilities serving reasonably priced food and drinks throughout the day. The central area of the hall is reserved for the 55 public participation games, any and all of which you are welcome to play until the close of the show at 4.30pm. With so many historical and fantasy games in different scales to choose from you’re sure to find games to play and enjoy. By collecting your ‘game tickets’ from each game that you play, you can then enter your ticket into a prize draw. Hammerhead has traditionally attracted a ‘healthy’ number of younger gamers. Healthy for the hobby - we strongly hold to the belief that the young sci-fi/fantasy gamer of today is the gamer of tomorrow! Last year at 3.30pm there were still hundreds of gamers playing games – a very rewarding sight! Because it is a Saturday show, most people don’t have to get up for work the next day, so can stay longer, indulge themselves for a full day engaging in their favourite hobby alongside fellow enthusiasts. Dr Mike Salwey will be running his excellent painting clinic again this year. The table top sales area opposite the entrance has replaced the traditional bring and buy and has proved very popular. Visitors can book one hour table slots to sell wargame items, and table booking takes place in the four weeks leading up to the show. There may a few sessions available on the day, please enquire at the booking-in desk on arrival. A quick scan of our trader list will clearly show that all genres, accessories and all the major figure scales are represented. We have deliberately avoided simply filling the hall with traders to create a 1 day shopping hall - that’s not what Hammerhead is about. We have kept the cost of trade stands as low as possible at £50 per six foot (plus a small charge for trestle tables if required), which represents excellent value for traders relative to the thousand plus expected in attendance. Thanks to all that gave feedback on last years’ show, which helped us to identify a few issues which we have endeavoured to improve upon for Hammerhead 2016. The opening times for the cafeteria will be extended to late in the afternoon, and we will be increasing the number of designated disabled parking bays available adjacent to the main entrance and ‘police’ them more effectively. There are few other very minor issues which have been addressed in regards to toilets, litter bins, etc. Come and join us for a great day of table top gaming on Saturday 5th March at Hammerhead 2016.